Whether it’s the centerpiece in your living room or an accent to your office, your oriental rug is bound to be a staple in your décor and too unique to be replaced. Everything from flooding, moths, and fire to everyday wear and tear and aging runs the risk of damaging your rug. Protect your investment and stop the problem in its tracks by entrusting your rug with the experts at Ahdoot Oriental Rugs. The professionals at Ahdoot will recreate any damaged pieces of your rug, reweaving the underlying foundation as well in order to make the repair as seamless as possible. They can make restorations undetectable by mimicking the original weaving technique and using the same type of fibers. 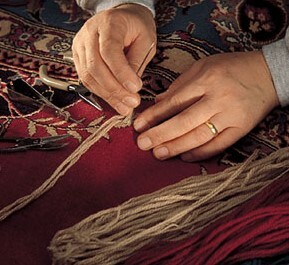 The edges and fringes are often the first parts of a rug to exhibit signs of damage. Fringes can be removed and rewoven or entirely replaced. Moths pose another danger to wool rugs, especially in dark and moist atmospheres. Ahdoot can both repair the damage caused by moths as well as help to clean and treat the wool for moth removal. Ahdoot can also revive color and correct color bleeding, stretch a crooked rug, and repair rips, slits, and tears. Your rug may have an aged appearance, particularly if it is a family heirloom, and it is essential for any repairs to match your rug’s antique look. Wool, cotton, or silk can be dyed to match the original and, if necessary, to imitate the older appearance. Schedule a consultation to discuss your rug repairs with our well-versed staff today.